We learn to play high quality Keyaki and Meari taiko drums from Japan och learn mostly traditional taiko works from different regions of Japan. Taiko means large drum in Japanese and this simple instrument has a profound range of expression. Rolling thunder and soft raindrops, roaring waves and galloping horses spring to mind. Taiko drums are played traditionally in Japan in many different ways, usually in conjunction with local shinto festivals. Nowadays there are international Taiko groups that perform with modern taiko pieces globally and there are taiko groups in many different countries. 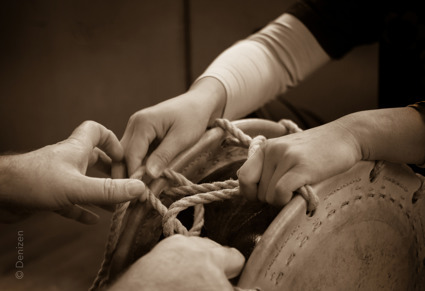 Taiko music is played in an intensive, meditative and sensitive way. Sound vibrations, energy and physical movement open channels of energy that are stimulating for mind and body. Sweden Taiko proudly arranges workshops with professional taiko players from Japan.